Don't waste a lot of time putting your resume together, get it done in the least amount of time possible. Our quick to complete resume template will cut out a lot of the work needed to assemble your information and properly format your resume. When much of the layout has already been figured out you won't have to spend as much time getting it done. Plug-in your information, make your feature selections then export it, send it or host it online here in our directory. Why would you want to write it the hard way? Doing it yourself? Knowing that the services from Resume4Free are really free eases the tension because you won't get a bill at the end. Sometimes things in life really are free and luckily you found one of them here. Stop wasting your time trying to figure out why this is no cost. It is, so just be happy about it and make your resume! If you want to help us in some way just tell people you know who need what we have here, post about it on your social media pages, etc. or don't it's up to you. Now on to the description of this template. There is an image on the left side, this can be your likeness or anything else you deem to be of value. Your name is written in large type below the image. Your address, etc. is to the right of the image all the way to the edge of the page. Your contact details are individually enclosed in brackets to separate them. The dividing line delineates your personal details from your education and employment details. The section titles are written on the left. Create a quick to complete cover letter too, we already wrote the letter portion. Our program will ask you about the company you are petitioning for employment. The program will insert your answers where appropriate, it is used just like our other programs. 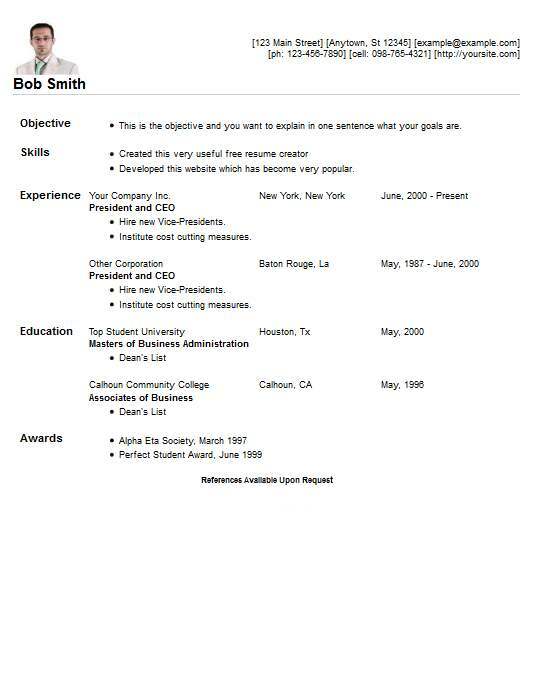 Make a resume and export this template, use it as-is or manually modify it for your application.